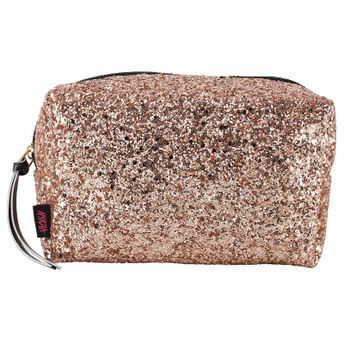 Add a little glamor to your life with Nykaa Bling It On Pouch in Starry Black. This stunning bronze shimmery pouch is all you need to turn up the style quotient. With a cute zipper closure, this pouch ensures your belongings stay safe and secure. It is roomy enough to fit your cosmetics, phone and more and stylish enough sit on your vanity table. Explore the entire range of Makeup Pouches available on Nykaa. Shop more Nykaa Cosmetics products here.You can browse through the complete world of Nykaa Cosmetics Makeup Pouches .Alternatively, you can also find many more products from the Nykaa Bling It On Pouch range.